About the Firm | McDevitt Law Offices P.C. McDevitt Law Offices, P.C. is a full-service personal injury law firm with experience resolving cases for our clients through settlement, mediation, arbitration and trial in Chicago and throughout Illinois. We represent clients in a wide range of cases from car, truck and motorcycle accidents to cases involving construction accidents, medical malpractice, product liability, premises liability and other causes of serious injury. Our clients receive personal service and attention to their case. Many of our clients have suffered an injury that has significantly interrupted their lives. We know this can be uncomfortable as the medical bills and other household bills climb. We believe in being accessible to our clients. We personally answer our clients' phone calls and handle every aspect of their claim. The attorney you meet with and hire at your first meeting is the lawyer who will handle that claim from beginning to end. We arrive at the office early and we are available after hours as well. We deliver the results our clients deserve. If you or a family member are involved in an event resulting in serious personal injury or death, it is critical that steps are taken quickly to gather and preserve the necessary evidence to put you in the best position to successfully resolve any claim or lawsuit brought on your behalf. McDevitt Law Offices, has a team of attorneys and outside consultants including engineers, accident reconstructionists and others who are ready to immediately assist in the gathering of facts and data necessary to place the client and case in the best position possible. As soon as you call our team in the aftermath of an accident, we spring into action making sure there’s a solid foundation for your injury case. This may include the immediate taking of statements from witnesses to the incident, preserving evidence at the accident scene, downloading data from motor vehicles and identifying or preserving any video from cameras in the immediate area. It’s important to call us as soon as you can after an accident, because failing to immediately preserve this evidence could be harmful to your injury case or claim. If you’re facing recovery from a personal injury, the last thing you need to worry about are the legal aspects of your case. We want to take those concerns off your shoulders. Our attorneys are committed to serving our clients, which is why the attorneys themselves are available to your calls and questions. You deserve a fast response to your questions or concerns and we make it our priority to make sure your questions are immediately answered. 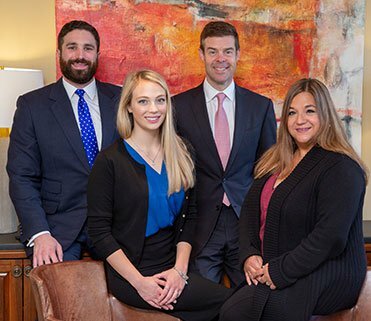 Our team of attorneys has decades of experience working with clients and exclusively focuses on personal injury cases, which means attention to detail and courtroom experience which caters to the needs of your specific case and ultimately maximizes the value of our client’s claims. When it comes to results, we have a proven track record that we are proud of. We have successfully resolved cases through verdict or settlement in excess of $100,000,000 for our clients in a variety of personal injury claims. We're not afraid to do what it takes to help you get the justice you deserve.